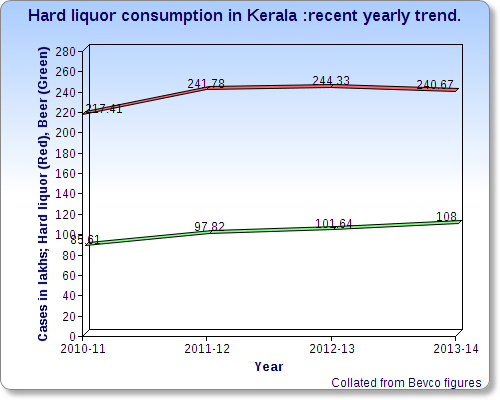 Home » Health Policy » Kerala bends the curve on hard liquor consumption. Kerala bends the curve on hard liquor consumption. Many reasons have been put across for this change. Increasing awareness programs from government , reducing availability of liquor etc. However incremental taxes on alcohol could be the primary reason as shown by increase in tax revenue for the government (see chart below). Alcohol has become increasingly costly. Increase in beer consumption if viewed a gateway phenomenon can indicate more use among young people, however if it is viewed as behavioral change among seasoned drinkers it can indicate how punitive tax structures are helpful in harm reduction. Recent government decision to shut down bars because of poor quality of service has resulted in mixed reactions. Sociologists have commented that …. that neither prohibition nor cutting down of availability is going to bring down Kerala’s liquor menace which is causing serious social and family problems. According to them, the problem in Kerala is not liquor as such but it is the underlying social and psychological factors that are forcing Keralites to hook to booze. It is indeed a multidimensional problem. Will need more analysis in coming years. By kumarRam in Health Policy on May 10, 2014 .